By the 10th century, Christianity had spread throughout much of Europe and Asia. The Church of England was becoming well established, with its scholarly monasteries, and the Roman Church and the Eastern Orthodox Church were continuing their separation, ultimately culminating in the Great Schism. 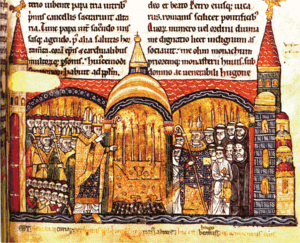 With the division and decline of the Carolingian Empire, notable theological activity was preserved in some of the Cathedral schools that had begun to rise to prominence under it. Intellectual influences from the Arabic world (including works of classical authors preserved by Islamic scholars) percolated into the Christian West via Spain, influencing such theologians as Gerbert of Aurillac, who went on to become Pope Sylvester II and mentor to Otto III. (Otto was the fourth ruler of the Germanic Ottonian Holy Roman Empire, successor to the Carolingian Empire). From the 6th century onward most of the monasteries in the West were of the Benedictine Order. Owing to the stricter adherence to a reformed Benedictine Rule, the abbey of Cluny became the acknowledged leader of western monasticism from the later 10th century. A sequence of highly competent abbots of Cluny were statesmen on an international level. The monastery of Cluny itself became the grandest, most prestigious and best endowed monastic institution in Europe. Cluny created a large, federated order in which the administrators of subsidiary houses served as deputies of the abbot of Cluny and answered to him. Free of lay and episcopal interference, responsible only to the papacy, the Cluniac spirit was a revitalising influence on the Norman church. The height of Cluniac influence was from the second half of the 10th century through the early 12th. The Cluniac reform of monasteries that began in 910 placed abbots under the direct control of the pope rather than the secular control of feudal lords, thus eliminating a major source of corruption. This sparked a great monastic renewal. Monasteries, convents and cathedrals still operated virtually all schools and libraries and often functioned as credit establishments promoting economic growth. Monastic contributions to western society included the teaching of metallurgy, the introduction of new crops, the invention of musical notation and the creation and preservation of literature. Premonstratensians, also known as Norbertines. The "Baptism of Poland" (Polish: Chrzest Polski) in 966 refers to the baptism of Mieszko I, the first ruler of a united Polish state. His baptism was followed by the building of churches and the establishment of an ecclesiastical hierarchy. Mieszko saw baptism as a way of strengthening his hold on power, with the active support he could expect from the bishops, as well as a unifying force for the Polish people. Mieszko's action proved highly successful; by the 13th century, Roman Catholicism had become the dominant religion in Poland. In the Middle Ages, the Kingdom of Hungary (which was larger than modern day Hungary) was Christianized between 970 and 1038. Between the 8th and the 13th century the area of what now is Belarus, Russia and the Ukraine was settled by the Kievan Rus'. An attempt to Christianize them had already been made in the 9th century, with the Christianization of the Rus' Khaganate. The efforts were finally successful in the 10th century, when about 980 Vladimir the Great was baptized at Chersonesos. He was also married to the Byzantine princess Anna, the sister of the Byzantine Emperor Basil II. However, Christianity is documented to have predated this event in the city of Kiev and in Georgia. The success of the conversion of the Bulgarians facilitated the conversion of other East Slavic peoples, most notably the Rus', predecessors of Belarusians, Russians, and Ukrainians. By the beginning of the 11th century most of the Slavic world had converted to Eastern Orthodox Christianity. 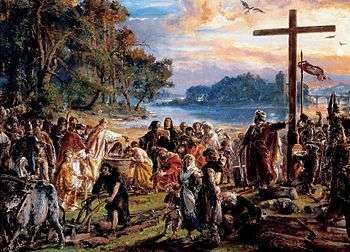 966 Mieszko I duke of Poland baptised, Poland becomes a Christian country. ↑ "Archived copy". Archived from the original on 2008-09-07. Retrieved 2016-02-06.